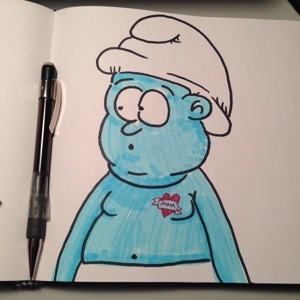 only 10 minutes into the new year (figuratively) and I already have two art shows to hype. Talk about excitement! The first will open on May 4th at Screen Ink, LNK-NE. This will be a group show with my co-worker Zeljka Hassler and buddy Dan Kroll. It’s theme will be something kid-oriented, though not solidified yet. Zeljka’s working on a fairy-tale world she’s created, Dan’s got ideas brewing, and I’ve got a few things up my sleeve. This will be a “First Friday” event – so plan ahead and plan accordingly. The other one will be on October 2nd at Screen Inl, LNK-NE. This will be another group show, with Mt. Make More associates Ryan Holt and Peter Morris. This will be a shoot from the hip, wild-style, anything-goes Halloween themed show, with all the stops pulled out. This will be a fun show. Mark your calendars now. Be there. 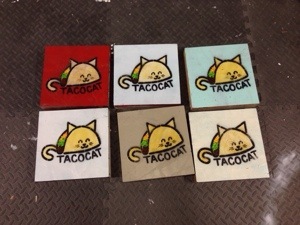 Also here are some Tacocat pieces that are available. Let me know if you want one?